I don't find this Appropriate at all..When you love someone,the reply of ''I love you too'' comes automatically and is not forced...If i tell anyone ''I love you'' and i hear ''Thank you''..That's it,I will never say it to this person again. Saying I love u back is a very heavy line...so I can just say it to make d other person feel appreciated, then feel guilty later. Lol Stella. The first person that told me thank you when I said I love you was my Father. Guy man is so unromantic. Did you sneeze and I said "Bless you"? Did you trip and I said "Careful"? Did you work and I said "Weldone"? Irú thank you iranu wo nìyẹn? EBooBae, had better be guided. It depends tho. I do it sometimes because i don't know how to lie! Some people deserves that kinda reply. It's not everybody you tell "I love you too". esp when you don't love them. Just tell them thank you. Thank you for loving me. Lmaooo 😂😂 granted the lady is a case but I think she might be right here. Why lie to the person. 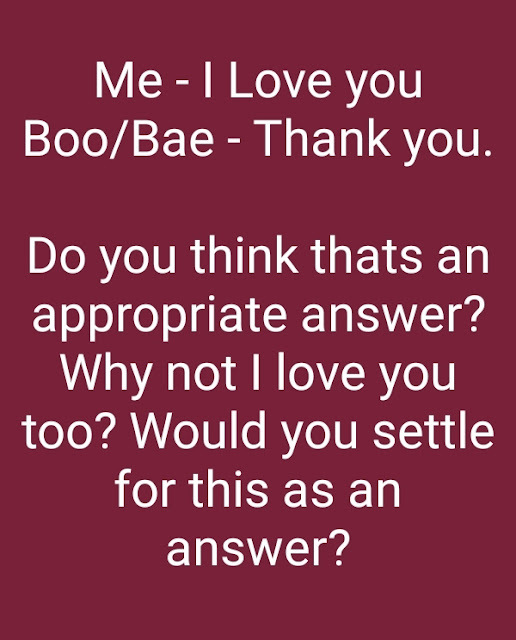 😂😂😂🤣 The appropriate answer is I love you too but at times I tell hubby thank you if I'm forming vex, he will just give me side eyes. I would never settle for that biko. with that answer it shows something is wrong somewhere. That's a typical reply from a Nigeria. I love to express myself...i love u too canneva be hard for me to reply. Parents should always tell their kids that,so that they grow up with it. As long as you a friend or family, I use "I love you too". But once it's a love interest, in order not to pass the wrong signal I simply opt for "Thank you". i hardly reply and when i do its dependent on so many things. I am the kind of person that finds it very difficult to say what I don't mean.I have said thank you countless times. I tell you "I love you" and you reply "thank you" just tell me how you want your thunder. Roasted or boiled or fried? What if he doesn't feel the same way? Would you rather he lied? I have been on this table a number of times. I only respond in the affirmative when i feel the same way. But trust me, when i eventually say it, he'll know i meant every single word. I don't think this question is implying the profession to/from any random person, rather Its pertaining to someone dear to you, or someone who thinks he/she is dear to you, or someone who is honestly trying to shoot his shot.. So now from the above, if I'm in any of these categories and that reply up there is what I get, hmmm. I might never gain the confidence to use such phrase again. U don't know the courage I summon in doh first place. I will just pretend like I never even declared such. and as an addition, will compliment nothing about you again. No, I won't settle for "thank you" as a response to my "I love you". If the 'thank you' is from your significant other then I will assume he's either teasing you or mad at you. If it's a first time thing, imma say this... Only say those words when you are prepared to let him go if you ain't sure of his response. If you love someone, they should know it before the words are uttered. I say thank you when I don't want to pass a wrong message to a love interest. Infact, just this morning, an admirer sent me a message and at the end he said "I miss you" I simply replied "thank you". Theres dis guy who tells me thank you. I always hope one day he will open up and tell me back. Am I stupid? Those mumu guys that will meet you today and by the next day, they will start saying "i love you". You reply "thank you" but them nor go belleful. They will insist you tell them "i love you too" even when they know there are no intimate feelings yet. How about when you greet a person (good morning), and then he/she replies with thank you... That's so annoying. You even got 'thank you' as response. Here it's 'ehee'. My own is if l hear, thank you or really hmnn ! I no dey waste time l dey withdraw am sharp, sharp...l no go allow love load compress me. Lmaooo so if u love someone, the person must love u back? I love you, can hard me to talk ehen ! If I dey vex and you tell me say you love me, na "OK I hear" go be my reply oo... Better sha no make me vex. Saying thank you seems brusque. The receiver might feel slighted. I remember when i started dating my hubby. He told me "I love you", rather too early and was intently waiting for my response. I wasn't sure i was "there" yet. So in response,i held his palms in mine and said lovingly,"i know". So it did ease the budding tension and he smiled. Saying thank you isn't nice, but it simply means the person isn't sure of their feelings yet at that moment and they shouldn't be pressured to say it simply because you did. 'I love you", is also a big commitment to some and they don't throw the words around easily. "I love you too" comes naturally if you love the person. If I don't love you why will I reply with I love you too? I can’t tell you ‘I love you too’ when I don’t feel the same way. But to say ‘thank you’. Ahh! Abeg no talk that one oh. It’s not a favour granted. My aunt was triple dating in school and would always respond "ma mu nwa kwa" meaning "me too" in Igbo anytime she's with her main boo and the side boo calls to tell her "I love you". I know someone who reply Thank you to every greeting. It is not appropriate. I was in a relationship, he was always saying I love you at the end of every conversation .until it tuned to thank you , when I say I love you . the killer is he was so cold and distant when replying . I knew I had lost him, alas our eleven months relationship went sour, no quarrels, no misunderstanding. It naturally sniffed out... I blamed it on distance , it was " too perfect " to die when I was already dreaming " forever "